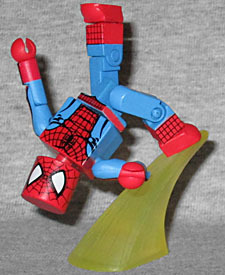 While attending a science exhibit, young Peter Parker was bitten by a radioactive spider; this granted him special abilities, and he became the hero Spider-Man. When his uncle was killed by a criminal he had let go, Peter swore to live by the creed of "With great power comes great responsibility." There's not much to say about a plain red and blue Spider-Man. It's based on the videogame design, but the videogame design is based on the comics, so there are no surprises here. Big white eyes, thin black webs... you get the idea. He comes with the usual webline, and there's also a yellow "swoosh" base included, which we assume is meant to make him jump. Ever since the Raccoon City Incident, in which most of the population was transformed into bloodthirsty zombies, Chris has been fighting continuously against the spread of bioterrorism. He helped usher in the dissolution of the Umbrella Corporation, and now searches for his missing partner, Jill. 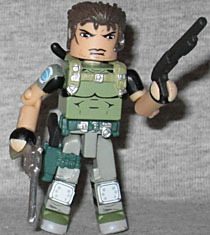 Chris Redfield is one of the stars of the Resident Evil games, and was one of the two playable characters in the original. The MvC design (based on RE5) keeps his classic green colorscheme intact, and the Minimate gets to make a lot of complicated paint masks to duplicate it. Fingerless gloves, stripes on his sleeves, kneepads, all that. He has a working holster, a fancy new belt, and a harness around his shoulders. His hair piece includes a microphone headset sticking out of his ear. He's armed with a small black pistol, a shotgun, and a silver revolver that's larger than the shotgun for some reason. There's also a knife that plugs onto his back, but it can't be removed from its sheath. This entry was posted in Art Asylum, Marvel, MMMR and tagged Capcom, Minimates, Spider-Man, zombies. Bookmark the permalink.